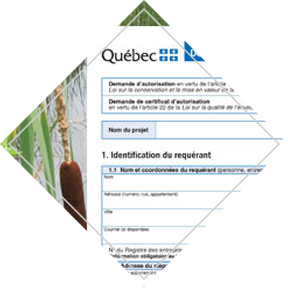 Our firm provides turnkey services for the preparation, drafting and submission of certificate of authorization (CA) requests to the Quebec Ministry of Environment and Fight against Climate Change (MELCC). The Environment Quality Act (EQA), or Act 72, states the conditions for which a certificate of authorization must be issued under section 22. Do you have a project that requires the submission of a CA request to the MELCC? Contact us! We will be pleased to assist you with the process. Paragraph 1 of section 22 (which deals with water, atmosphere and soil) states that no one may, without first obtaining an authorization certificate, carry out a project or activity that could result in the discharge of contaminants into the environment or a change in environmental quality. To that end, any response for the decontamination of soils requires the obtaining of a CA, if such decontamination activity is not already regulated by an approved rehabilitation plan under Division IV.2.1 of the EQA. Exceptions to the issuance of a CA are cited in the Regulation respecting the application of the Environment Quality Act and the Ministry of Environment’s Administrative directive (i.e. the guidelines on administrative exclusions of EQA section 22). The CA, as well as the rehabilitation plan, must be obtained before the project or decontamination activity can be carried out. Accordingly, the large-scale implementation of in-situ treatment techniques to restore a contaminated site wholly or in part is subject to the application for a certificate of authorization or rehabilitation plan.